Michael Moorcock surely needs no introduction. He is the creator of Elric of Melnibone, the author of countless science fiction novels; Behold the Man being my personal favorite, eternal champion, enchanter, bard, banjo player, collaborator on the Hawkwind classic Warrior on the Edge of Time, and the writer of the inspirational Sonic Attack, as we all surely know. 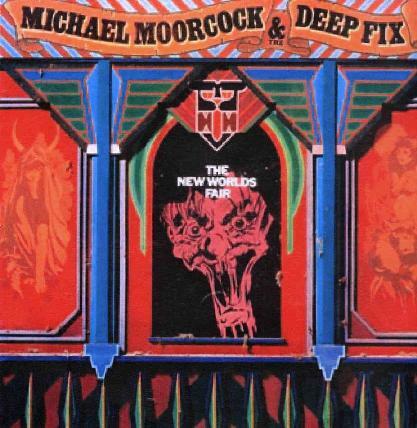 New Worlds Fair, for introduction, was first released way back in 1975 on United Artists, and it features the likes of Simon King, Simon House, Nik Turner, Allan Powell, Snowy White, and Dave Brock, and it is thanks to Esoteric Recordings that we now see it re-issued here with seven bonus tracks for our musing. These bonus tracks include demo and single versions of Dodgem Dude, Starcruiser, The Brothel in Rossenstrasse, and a previously unreleased version of Kings of Speed. It also features in the accompanying booklet, an essay by Nik Turner, and it is essential for lovers of Michael Moorcock’s work. My personnel favorites are Song for Marlene and the all too short Come to the Fair. These two tracks both leap at me as far as the whole is concerned, and apart from the narrations, they are all that keep me interested in the album. If middle of the road, mundane songs, are your thing, then dig right in. If not, stick with the novels my friend, because you may be disappointed, if you have not heard it before.